If you're looking for a really unusual fish for your tropical freshwater aquarium, Peters' elephantnose fish are second to none. Their fascinating appearance, with the lower lip extended like a long snout, is accompanied by a high degree of intelligence and intriguing behaviour. Although they can be shy, patience and care will encourage them to be friendly, active participants in the aquarium community. Elephantnose fish can be kept in water of varying hardness but need it to be neutral or slightly acidic. Because they are very sensitive to changes in water conditions they are not a good idea for beginners and are best suited to larger tanks where stability is easier to maintain. They are particularly sensitive to salt. The temperate should be kept around 27°. 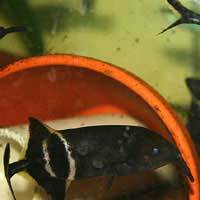 Black or dark brown in colour with attractive white stripes across the tail, elephantnose fish are smooth-skinned. Like many scaleless fish they can be sensitive to common aquarium medicines, so always check before treating the tank where they are living. In the wild, elephantnose fish are nocturnal. They are happiest under dim lighting in aquariums with plenty of hiding places. Hollow logs, open at both ends, are a particular favourite, and they will move around more confidently if there are lots of plants they can use for cover. Provide a soft, sandy substrate so that they can root about in it with their 'noses'; gravel can easily injure them. Elephantnose fish have a unique feeding style, using their 'noses' to flip food up into their mouths. In the wild they eat worms and insects, and in the aquarium bloodworm of blackfly larvae are a favourite meal. Some elephantnose fish can be persuaded to eat frozen worms or even flake food but it's a bad idea to rely on this. In case you get a fussy eater, have some liquid fry food ready as a back-up, easy to sift out of the water. Elephantnose fish tend to be slow eaters so they can struggle in aquariums where there's a lot of competition for food. If you take your time and build up trust, they can learn to take food from your hand so that you can supply them with an extra meal at dusk when other fish are less active. If your elephantnose fish slides its proboscis across your other fish from time to time, don't worry - it isn't trying to eat them. This is simply a means of communication and it can be an affectionate gesture, much like a hug. Naturally territorial, elephantnose fish need around two hundred litres of water each to be happy, though they can share that space with other types of fish. They are best kept either singly or in groups of three or more; keeping two will often lead to serious bullying. With other types of fish they tend to be shy, though individual temperament varies a lot. Because they are soft-skinned and move relatively slowly, and because they are slow eaters, elephantnose fish should not be kept with aggressive or boisterous fish. They grow up to twenty four centimetres in length but can live happily alongside peaceful fish of anything down to a third of their size. The other remarkable characteristic of the elephantnose fish is its electric field. Far gentler than that generated by a stingray or electric eel, this is used not for defence but for navigation, for finding food, and for finding a mate. Male and female elephantnose fish have distinctly different electrical signatures but these can be distorted in the aquarium, which may be why they have never bred in captivity. Although it's difficult to sense the elephantnose fish's electrical field directly, you can tune into it by placing two electrodes in the aquarium water and connecting them to an amplifier. The field will then manifest as a series of clicks, increasing in frequency hen the fish is distressed or excited. Although you shouldn't leave the electrodes in the water between 'conversations', you can use this method from time to time to check on your fish's well being. With so many unusual and intriguing qualities, elephantnose fish make wonderful pets for any aquarist who is prepared to give them the time and attention that they need to prosper.